The building step does not necessarily need to happen in the view script. In fact the view helper just forwards the buildNavigation() call to the Pimcore\Navigation\Builder service. You can also build the navigation in your controller or a service and pass the navigation object to the view. Only documents are included in this structure, Folders are ignored, regardless of their navigation properties. Having set up the navigation container as shown above, you can easily use it to render a navigation tree, menus, or breadcrumbs. The renderMenu() method renders the menu to the deepest available level. Levels trees which are not within the active tree, and levels below the latest active page must be hidden using CSS. Name: Document's name used in the navigation (label). Title: Document's title used in the navigation - the HTML Attribute title. Exclude from Navigation: Property to quickly exclude a page from the navigation. If the standard HTML output of the render() method is not suitable for a project, there is the possibility to provide a custom script for the menu HTML. Using the Navigation Helper with Sites. In the following example we're adding news items (objects) to the navigation using the callback. The navigation tree / container (\Pimcore\Navigation\Container) is automatically cached by pimcore and improves significantly the performance of the navigation. To benefit from the cache it's absolutely necessary to don't use Pimcore\Model\Document objects directly in the navigation templates / partial scripts, because this would result in loading all the documents again in the navigation and bypasses the caching mechanism of the navigation container. But sometimes it's necessary to get some properties or other data out of the documents in the navigation to build the navigation as it should be. For that we've introduced a new parameter for the navigation view helper, which acts as a callback and allows to map custom data onto the navigation page item. Later in the template of the navigation (Navigation/partials/navigation.html.php) you can use the mapped data directly on the page item object. Using this method will dramatically improve the performance of your navigation. Sometimes it's necessary to manually set the key for the navigation cache. You can disable the navigation cache by setting the 5th argument to false. A document does not show up in the navigation. Why? Why is the navigation not appearing? See the above question. If none of the documents have a navigation title set the render function will simply return nothing. Why is the homepage not appearing in the navigation? 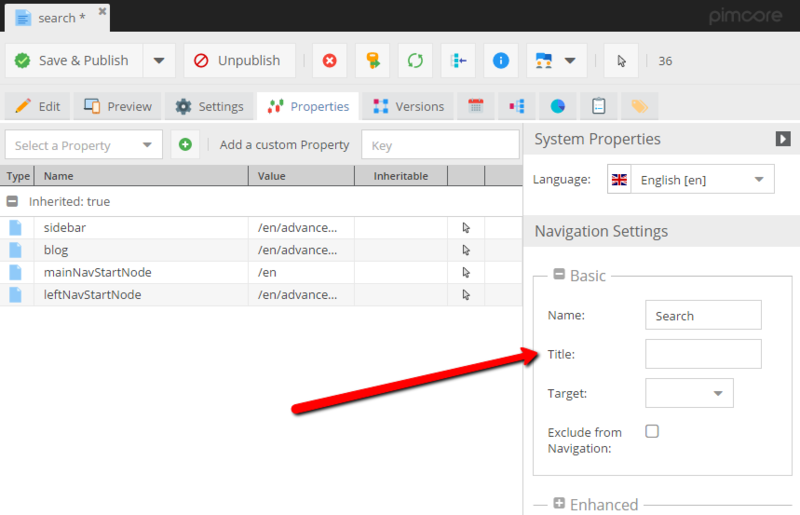 If you retrieve the home document (which always has the ID 1) you can also retrieve its navigation properties so that they can be edited from the Pimcore admin interface like all the other documents.